I talked about the bigger picture significance of this event for me here. First, let’s talk about Ragnar. The easy description is that it is a relay – 12 people run roughly 200 miles in 36 legs. 6 people “live” in one van, and they run the first six legs. The 6 people “living” in van # 2 then take over and run the next six legs. And the vans leapfrog each other like that until the finish line. 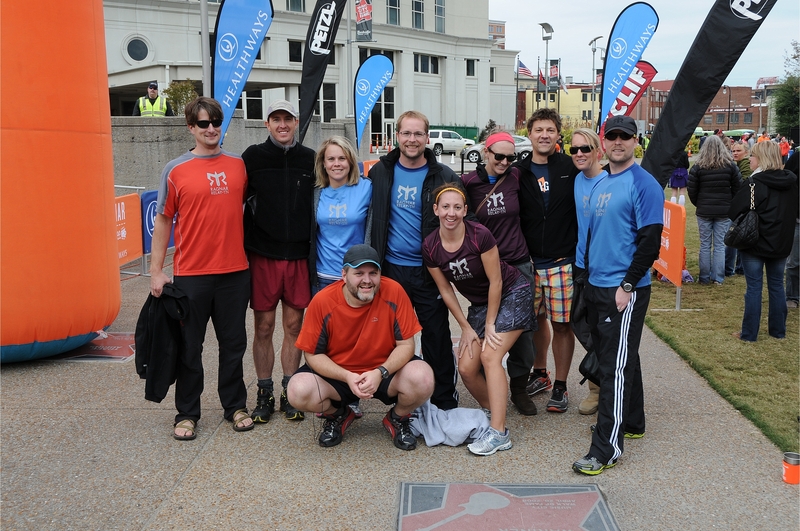 In this particular Ragnar, our team started in Chattanooga at 9am on Friday and crossed the finish line in Nashville at roughly 3pm on Saturday. They build the legs so that teams can be formed with various levels of experience and speed – each leg is rated “easy” through “very hard”, and there are always one or two runners that have a relatively light load and two or three that have an exceptionally difficult load. But describing a Ragnar by talking about the logistics is a bit like describing a song or poem by discussing its cadence or rhyme structure. That’s accurate, but doesn’t quite get at the thing. Ragnar is camping and running and “living” for 30 hours in a small van with people you just met yesterday (or maybe even this morning). 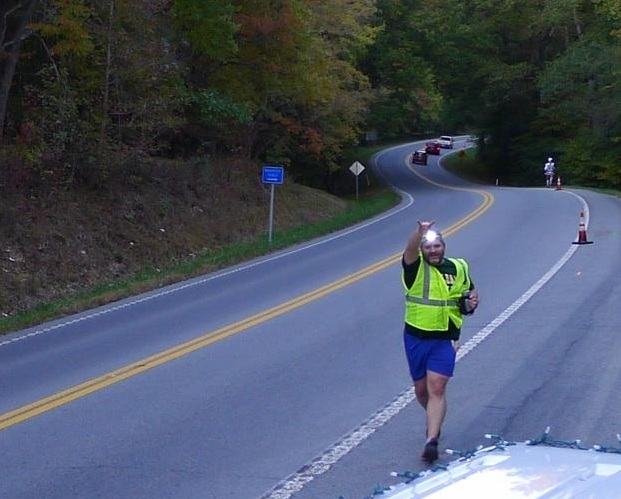 Ragnar is cowbells and encouragement and airhorns and pulling over every chance you get – and not just for your team, but for all the teams. Ragnar is a shooting star during your 3.5 miler at 3am. 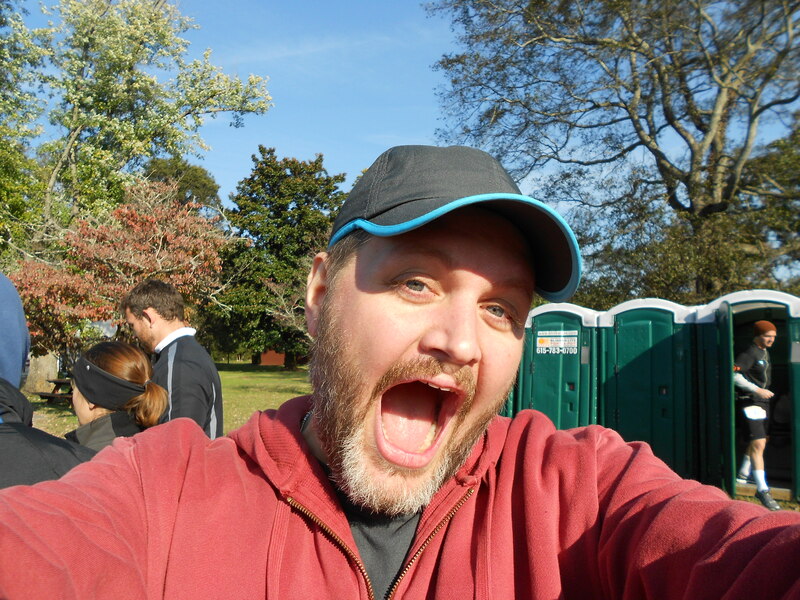 Ragnar is running and logistics and craziness – but Ragnar is also an experience and a memory. And what an experience. So … when I committed to do this I had run about zero miles. Pretty much exactly zero miles. So I got the “newbie runner” position – I’d been working towards a total of about 10.5 miles in three legs measuring roughly 4.5, 1.5, & 4.5 miles. And I was very comfortable with that. 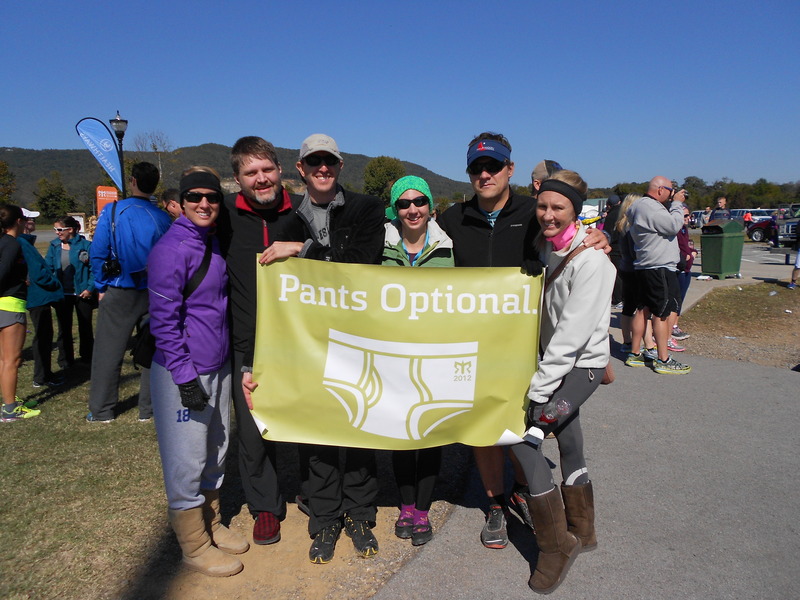 But about three weeks before the race kicked off, our team (Pants Optional) lost a runner. Since the best options for last minute replacements probably needed to be in that “newbie runner” slot, I agreed to move. And I’m glad I did … but. My mileage increased to more like 17.5. My first leg was 8.1 miles, and was a total downhill bomb over the first half. In the first 4 miles, I lost about 900 feet in elevation. And while the downhill itself is tough, the bank of the road on the curves was worse. I had to hold back to not just fly down that mountain. And then at the bottom I had another 4 miles through the Tennessee countryside, ending in a town called Cowan. I was runner number 12, so this leg happened during sunset and it was totally dark when I got to the exchange point. And I was ready to be done running. Our van was then off-duty … we then went and ate some dinner at a little Italian place in Cowan, and it was GOOD. And then we drove up to the next major exchange in Tullahoma to wait on the other van. I wound up being “on duty” for a lot of this one, so got pretty much no sleep. The second leg for me was a 3.5 miler that happened at about 3am. The night was very cold and clear, but the race bible lied. Well, not lied exactly. But misled. See – there is an elevation profile for every leg, and this one was no different. But the Ragnar organization puts on races all over the country, in very rugged territory, and they apparently have standardized their scale – which was 0 to 2000 feet. On this leg, with a total elevation change in a 100 foot range, that meant it looked very flat. It wasn’t, however, flat. Much of this one was one of those long, gradual uphill climbs that aren’t steep enough to slow down but never let you coast for a minute. And I just wasn’t prepared for it. Overall, my time was fine – but I was not happy with how this leg went. Back in the van – I changed out of my clothes, laid down, and don’t remember anything for the next 3 hours or so. The next major exchange was in Franklin, a suburb of Nashville. When we got rolling again, there was a surprising amount of overall energy in our van. At this point nobody had gotten more than 2 or 3 hours of total sleep – and I’d run nearly 12 miles in the most recent 12 hour period. But, daylight makes things better and we were off again. Leg # 3 for me was also the final leg for the team – and they did a spectacular job of showing off the city of Nashville. We ran the first mile or so near the Belmont campus, and then ran the entire length of Music Row. We then looped around to Bicentennial State Park, ran into Printer’s Alley downtown, and then through the crowds outside the bars and the nightclubs. By this time all of the runners were very spread out, so those people were surely … surely … wondering what the sweaty fat guy was doing trying to run through all of that humanity. And by then I was done – this was a 6 mile leg, and I started alternating runs and walks with a hill at about mile 4. The idea was just to survive, and I survived. About 200 yards from the finish line the teams all line up and wait for their runners – and then fall in behind them and the whole team crosses the finish line together. It was both cool to see my team, and also a shot in the arm to have all of those other teams there cheering. We crossed the finish line, had our team picture taken, and went straight to the beer tent and the pizza tent. The beer was too hoppy and the pizza was awful. But it was glorious. 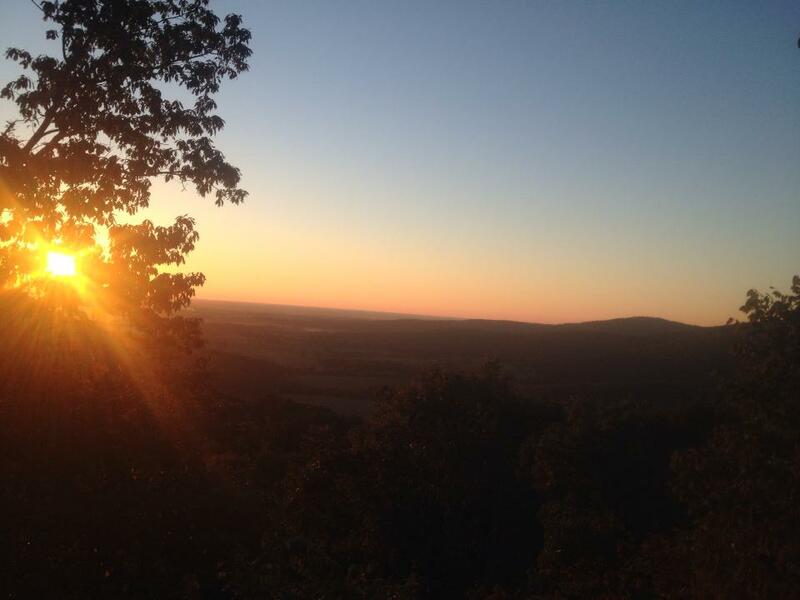 I can’t wait until my next Ragnar. – The biggest thing I’ll do differently next time is organize my bag better. I spent just entirely too much time rooting around in my stuff trying to find the right shirt or shorts or socks, or panicking because I couldn’t locate my headlamp or my iPod or my race number. That will need to tighten up. – Cowbells. Seriously. Cowbells are basically mandatory. – Three of us staggered to our hotel in Nashville after it was over and got takeout barbeque. After eating until we couldn’t take another bite, we passed out at about 7pm. I don’t remember anything else until 7am the next morning. That was one of the most glorious sleeps that has ever been slept. – Actually gave an “interview” (I put that in quotes because it was more like a recorded conversation) while I was in Chattanooga about taking up running and losing weight. THAT was a pretty awesome experience, about which I’ll have more if and when that ever gets published. That could also come with a big announcement. Fun! – October event, which means the streak is now up to 8 months. I’ve got races scheduled in November, December, January, February, & March. That will get me to 13. This is still no 10 years, but I’m starting to get attached to this streak. – Next race – Fall Pier-to-Pier Run/Walk, from the Hermosa Beach Pier to the Manhattan Beach Pier, Los Angeles, California … November 9th. This is great! You captured Ragnar perfectly. I couldn’t agree more with everything you said! Thanks! Looks like our vans were around each other most of the weekend … good times!